Hilary Grossman loves to find humor in everyday life. She has an unhealthy addiction to denim and high heel shoes. She likens life to a game of dodge ball - she tries to keep as many balls in the air before they smack her in the face. When she isn't writing, blogging, or shoe shopping she is the CFO of a beverage alcohol importer. She lives on the beach in Long Island. Dangled Carat by Hilary Grossman is one sensational read. Readers everywhere will be pulled in like a moth to a flame. This funny and romantic story will take readers on a journey, a journey deep into the lives of one very interesting couple. Women know men delay when it comes to full commitment. But then imagine the struggle for the man who is afraid of commitment. His girlfriend fights with the emotions and the hardships of being attached to a man who needs time to take on the full commitment train ride. Unlike most men, the one who fears it the most shows his love and care the most to his woman. Then there's how fast they both connected with one another. Talking and just being together is easy, but, like every other woman, Hilary wants the next step to happen. The suspense of that ever happening makes this the most exciting novel yet. Hilary Grossman has the talent of taking her readers straight from their seats and deep into the heart of her fictional world. Fiction with the most realistic issues any couple faces are all beautifully woven into a hilarious and sweet read. 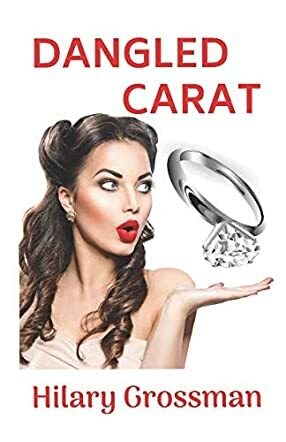 Dangled Carat is a story of how one woman meets a man, who instantly becomes her boyfriend. Their connection is strong enough to drag readers right into the pages. This novel was so good that it's hard to believe it was indeed fiction. The characters and their struggles were so lifelike that I could see myself inside their shoes. I loved it! Overall, I highly recommend this romance to readers everywhere. The conflicts are easy to relate to and the characters will leave readers laughing and crying throughout the novel. I definitely look forward to reading more by Hilary Grossman in the future.